I am honored to be invited along with Unspun and Herman Saksono to attend The 1st Malaysian ASEAN Regional Bloggers Conference – Blogging Mindfully and Responsibly in Intercontinental, Kuala Lumpur (KL), 23 – 24 April 2011. I was totally clueless about what’s happened in ASEAN blogosphere. So, what I have in mind about this conference is all about creating friendship with bloggers from all over ASEAN countries (Brunei Darussalam, Cambodia, Indonesia, Laos, Malaysia, Myanmar, Philippines, Singapore, Thailand, VietNam). But the first moment I step in KL and meet other bloggers, I realized that this is far more serious than that. Responsible blogging. This is the conference all about. Good point from one of the speakers in the conference: being responsible is a state of mind, whether or not you’re blogging. So, just be responsible. Period. But if we see the condition of most ASEAN countries that attend the conference (34 bloggers from 8 ASEAN countries), responsible blogging that has been discussed, actually become relevant. On the first day of the conference, bloggers from each ASEAN countries sharing their insight of blogging environment in their country. In Brunei, there are only social blogging. No political blogging. Blogging about the Royal Family is a big NO NO. They mostly blog about food and doing photo journalism. In Cambodia, the government is still very paranoid with bloggers. A blogger once being sued for printing a sensitive blog post and distribute it among his colleagues. In Singapore, a critical Blog has gazetted as a ‘political association’. This means the Blog must now follow the tight rules set for political parties in Singapore. This is in anticipation of the upcoming general elections, which now has been set on 17 May. In Thailand, there’s lesse majeste law which translate to ‘injury to the Monarch’. So if your blog ‘injured the Monarch’, it can be blocked. In Vietnam, bloggers would ‘talk in circle’ in their writing to ‘safely’ express their political view. In Malaysia, Blog House Malaysia shared that Malaysian blogs could break stories to offline medias. From what I’ve heard, the athmosphere could be tense between the bloggers and the government due to critical posts toward the government. Only in The Philippines, blogging situation is pretty much alike with Indonesian. We mostly blog about the lifestyle and we’re free to gather and form a community. On day 2 of the conference, the Former Prime Minister of Malaysia Dr Mahathir Mohammad & wife, the patron of Blog House Malaysia, and also Prime Minister of Malaysia Najib Razak & wife Rosmah Mansor, has attended to show their support. I was introduced to Ibu Rosmah as, “The BIG blogger from Jakarta.” And I was like, “Haha….” (I swear I see her cringed. She must thought I’ve wrote so many critical posts to Indonesian government or something). When I sit beside ibu Rosmah for lunch (It’s a round table lunch bloggers conference, and I sit in VVIP table :D), we didn’t talk much. But when PM Najib Razak mentioned me in his speech, “I am told the Asean bloggers who are here include some of their most influential, including heads of the countries’ respective blogger associations and a lady blogger from Jakarta who is also the author of 17 books.” She turned to me and smile, and I nodded gracefully :)) Check PM Najib Razak full keynote speech transcript at ASEAN Bloggers Conference. 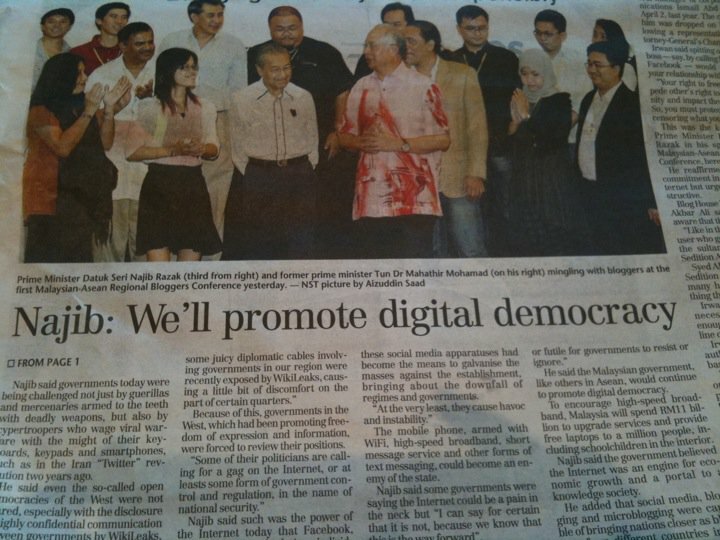 The conference resulting a KL consensus, basically a declaration of how we could make ASEAN a better blogging place. Check the 5 points of KL consensus here in ASEAN Blogger Networks. Hopefully, all of us could benefit from each other experience and we could form a stronger ASEAN through blogging. A very interesting idea from Unspun & Minh about ASEAN blogs aggregator website. I think it’s a great idea and we should do that. Thank you Blog House Malaysia & committee for inviting us. You all did a great job with the conference! And always a nice conversation with you guys…! Cambodia (Sopheap Chak, Kounila Keo and Ramana Sorn) – You rock, girls! Bong Se Lang Ong Te? Philippines (Tonyo Cruz and Blogie Robillo) – Love your sense of humor :)) Tonyo, you promised me Robin Padilla! Malaysia (Abigail Law and friends) – Stay happy and powerful! Love and see you all in Jakarta! Though we mostly post personal stuff on our blog, we have to be responsible for it, right?! Hihi.. You’re so inspiring independent lady! Honoured to have you with us and be part of a historical moment for Blog House Malaysia. Glad you had a good stay. 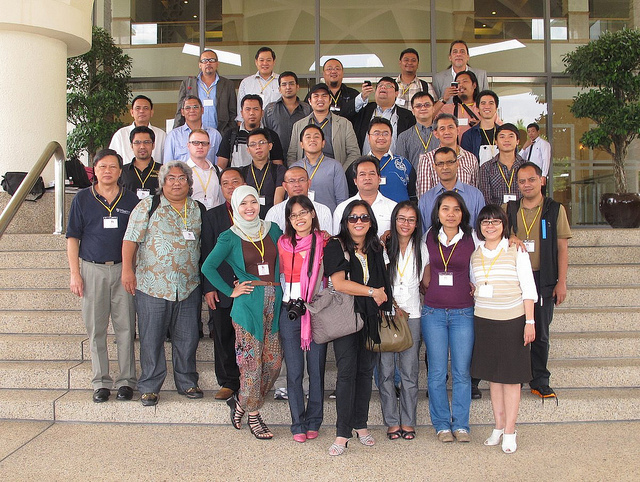 We shall work together, for the betterment of ASEAN blogging. Mbak Ollie, I am proud of You. I appreciate with the theme of ASEAN Bloggers: Responsible Blogger. So, we will aware that our posting in the blog can impact to all aspect of our life, not only person but also country, even world. What a nice wrap up! I am proud to getting known you. You are such an inspiring model. Catch up with you soon in Jakarta. Selamat ya. Baru aja baca-baca di page http://www.salsabeela.com/2008/05/16/baca-buku-di-perpustakaan-nasional/ . Trus iseng2 ke beranda. Tau2 abis dari Malaysia. Panjang juga umur blognya. Maju terus ya. Hi there salsabeela. Salam. Good to know that you enjoyed attending the blogger conference. I was there too. Hope you can e mail me and we can get to know each other better. I love to hear about other bloggers from other countries. Thanks. So when is the next blogging conference in Jakarta?